Denver's altitude is 5,280 feet above sea level, earning it the obvious moniker, the Mile High City. The railroad route directly west was built as Denver, Northwestern & Pacific Railroad and came to be owned by its successors, Denver & Salt Lake Railroad and Denver & Salt Lake Railway, as well as Denver & Rio Grande Western, Southern Pacific, and lately, Union Pacific through a series of mergers. It's apex was first at Rollins (Corona) Pass at 11,680 feet ASL and then inside Moffat Tunnel at 9,239 feet. Making up the difference (6400 and 3959 feet respectively) while at the same time keeping the gradient manageable and cost efficient was a balancing act that meant gaining altitude as evenly as possible. If there was a ramp of earth, much like Sherman Hill in Wyoming, the construction engineers would have had little trouble. As it was, construction from Denver into the foothills was the most difficult part. They had to claw and scrape for elevation to reach Boulder Canyon and the Flatirons. 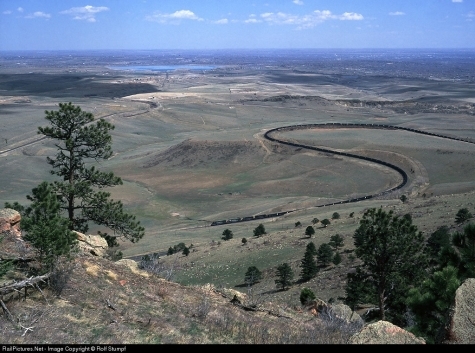 A tongue of land jutting out from the foothills became the stepping stone between the western high plains and the east face of the Rocky Mountains. The long, winding turns climbing onto and upon the butte are both ten degrees curvature, thus named the little ten and big ten curves.